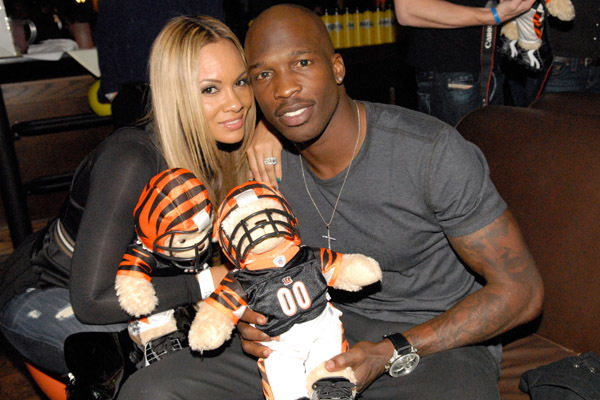 The unfortunate domestic violence incident that occurred between Evelyn Lozada and Chad “Ochocinco” Johnson last weekend set off a downward spiral of disheartening events. The couple’s reality show, which was set to premiere in September, got pulled from Vh1, Chad got dropped from the Miami Dolphins and some people started cluttering the web with hateful vitriol, with an emphasis on victim blaming, but I digress. The most recent development in the situation is that Lozada filed for divorce and released a statement saying that Chad failed to take responsibility for his actions and that he needed help. Evelyn isn’t innocent either, but I’m not here to play the “whose fault it really is” game because they both need help. They also represent a lot of couples who seem to think dysfunction is the norm and choose to stay with and/or marry people who bring out the worst in them. How many times have you met someone who was ok with obsessively stalking their partner by constantly questioning their whereabouts, checking their phone, social networks and email because of their own insecurity and/or desire to control what happens in the relationship. How many times have you been that person? How about couples who can barely get through a conversation about anything without erupting into a volatile argument? Evelyn obviously didn’t trust Chad, as we saw in an episode of Basketball Wives where they had the conversation about cheating. Chad also didn’t make trust easy for her. Look at the circumstances of how they got together. He was fresh off of a reality show where he chose a new “girlfriend,” who actually said that they were a couple right before he started being spotted with Evelyn. In said conversation about cheating, Chad told Evelyn that he was still working on being the man that she needed him to be, which to me says that he really wasn’t that interested in exercising self-control. Evelyn taught him that cheating would be ok when she told him that he should at least use condoms and that she would respect him if he just told her the truth. Be careful what you wish for, especially if you know you in your heart that you really can’t handle it. I don’t know the ins and outs of their relationship but clearly, there were some things wrong enough to warrant them not going through with a wedding even though they did it anyway. No one is perfect but you should trust your partner and if you don’t then you’re not secure with yourself as Evelyn obviously wasn’t. There’s no place for ego in relationships, as Chad clearly has a problem with if he doesn’t want to acknowledge the part he played in the downfall. I’m not an expert or a psychic but that headbutt was a volcano bubbling underneath the surface and it was only a matter of time before it erupted. Was Evelyn the button pusher? Maybe. It’s not far-fetched considering her track record but takes two to tango and one to make a difference. This could have been avoided if someone had just walked away. Years ago, I dated a man who enjoyed pushing my buttons (something he admitted after the fact) and I stuck around longer than I should have because he was such a good person when he wanted to be and we were good together during these bouts of positivity (but that’s not enough if someone makes you crazy). However, the epiphany that I needed to leave came when I tried to choke him. That was out of character for me but he made me so angry that I blacked out in a fit of rage and I promise you, it was divine intervention that kept me from going to jail (because my grip was so tight that he was gagging). I literally stepped outside myself in the middle of it, freaked out about what I was doing and then heard a voice that said, “That isn’t you. STOP!” and I stopped. From there, I new it was over and gathered the strength to end things. Say what you want about Evelyn, but I’m glad she filed for divorce. Again, they probably should have gotten married in the first place but all we can do is move on. I wish them the best and hope they both learn to become better people for themselves and the next person they fall in love with and I hope that the people who spectate their lives can learn from this as well.